BARCELONA, Spain--Along with the Galaxy S II, Samsung introduced its second Android tablet at the Mobile World Congress 2011. Joining the 7-inch Galaxy Tab, the Samsung Galaxy Tab 10.1 features a larger 10.1-inch WXGA (1,280x800-pixel resolution) TFT touch screen, and runs the latest Android 3.0 Honeycomb operating system. In addition, it's a Google Experience device, so the tablet will feature the stock Android user interface instead of Samsung's custom UI, TouchWiz. This should, hopefully, prevent any delays with future OS updates. In other good news, the Galaxy Tab 10.1 will be powered by a dual-core processor (Nvidia's Tegra 2 chipset, to be exact), so you should experience faster browsing, an improved gaming experience, and better overall performance, among other things. Another benefit of the new chipset is that it supports 1080p HD video recording (at 24 frames per second) and playback (30fps), which you can take using the back-facing 8-megapixel camera. There's also a 2-megapixel camera on front for video calls. The quad-band (GSM 850/900/1800/1900) tablet supports HSPA+, which is capable of 21Mbps, and also has Wi-Fi (802.11a/b/g/n) and Bluetooth 2.1. Physically, the Tab 10.1 measures 9.69 inches by 6.71 inches by 0.43 inch and weighing 1.32 pounds. Samsung says it's one of the thinnest and lightest 10-inch tablets on the market. The company also added a texture to the backside and grooves where you can place your hands when holding the tablet in landscape mode. It's a much improved experience compared with that of the original Galaxy Tab, which felt quite slick and plasticky. 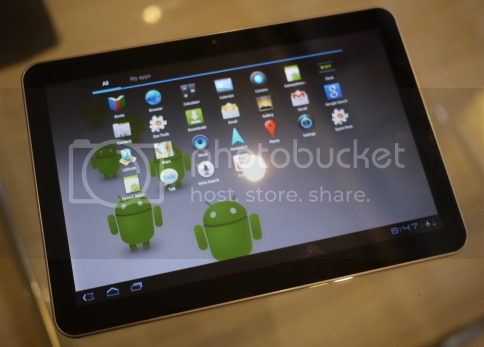 The Samsung Galaxy Tab 10.1 will be available in a 16GB and a 32GB model. Both are expected to ship this spring in Europe and Asia, with Vodafone as one of its carrier partners. Samsung said there is no current plan for a CDMA model, and U.S. availability, as well as pricing, were not announced at this time.